A monumental new history of Arsenal including details of the glory years under Herbert Chapman, George Graham and Arsene Wenger as well as reflecting on failure and tragedy is reviewed by ERIC BROWN. Somewhere deep in the recesses of my mind lurked a belief that I first covered an Arsenal match when the Highbury attendance dropped below 5,000 spectators. Yet surely that couldn’t be correct ? I was just 18, newly employed by the London office of Westminster Press and given the chance to report football giants like Barrow and Workington when they visited London. Newcastle United, Sunderland and Middlesbrough were also in the remit. And Leeds. It was Leeds I vaguely recall who were visitors on an occasion when the “Highbury library” had never been quieter. But was I right ? Fortunately a new history of Arsenal cleared the matter up. Season-by-season match details including every team line-up provided the answer on page 286. Arsenal’s penultimate match of the 1965-66 season under manager Billy Wright resulted in a 3-0 defeat for the Gunners against Leeds watched by just 4,554 people – the lowest ever Highbury crowd for an Arsenal first team game. Arsenal fans were boycotting matches in an effort to topple Wright who indeed left at the end of the season. A team including club legends like Frank McLintock, Don Howe, Peter Storey, Terry Neill, John Radford, George Armstrong and captain George Eastham had seriously underperformed. Before Leeds’ visit Arsenal had scored just 12 goals in 14 matches and one of those was an own goal. Only one of those matches had been won. At the end of the Leeds game a bugler played The Last Post. Which brings us neatly to the most poignant and topical section of the book: profiles of Arsenal players and former players killed or injured during wars. First world war casualties include Private John Flanagan of the Army Service Corps who succumbed to dysentery aged 30 in German East Africa(Tanzania). Flight Sergeant Bobby Daniel, a Welsh schoolboy international inside forward and brother of the famous Ray, was still only 15 when making his Arsenal debut. After 30 operational flights as a gunner in a 156 Squadron Lancaster bomber, his aircraft went missing on a pathfinder mission to Berlin on Christmas Eve 1943. He was 20. Perhaps saddest of all is the story of Flight Sergeant Leslie Lack, signed by Arsenal in May 1939 as an amateur outside left. Returning from a mission to Holland, his Spitfire was shot down by “friendly fire”, and he died aged 21. This comprehensive history of one of England’s most illustrious clubs includes everything you would expect and more. There is background on the controversial move from Plumstead to North London inspired by Henry Norris while statistical coverage of each season includes appearances and goals charts, details of debuts, a League table and brief written summary. Player career records, international appearances, top 50 goalscorers, top 20 clean sheets, profiles on managers and more than 100 of the biggest names to represent the club complete a book which, quite simply, includes everything you would ever want to know about Arsenal. Including clearing up an attendance mystery. 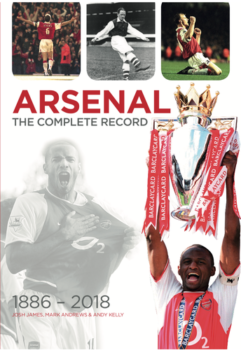 Arsenal The Complete Record 1886-2018 by Josh James, Mark Andrews and Andy Kelly is published by deCoubertin Books. Price £25 hardback.